We first meet Sasha in her mid-thirties, on her therapist’s couch in New York City, confronting her long-standing compulsion to steal. Later, we learn the genesis of her turmoil when we see her as the child of a violent marriage, then as a runaway living in Naples, then as a college student trying to avert the suicidal impulses of her best friend. We plunge into the hidden yearnings and disappointments of her uncle, an art historian stuck in a dead marriage, who travels to Naples to extract Sasha from the city’s demimonde and experiences an epiphany of his own while staring at a sculpture of Orpheus and Eurydice in the Museo Nazionale. We meet Bennie Salazar at the melancholy nadir of his adult life—divorced, struggling to connect with his nine-year-old son, listening to a washed-up band in the basement of a suburban house—and then revisit him in 1979, at the height of his youth, shy and tender, reveling in San Francisco’s punk scene as he discovers his ardor for rock and roll and his gift for spotting talent. We learn what became of his high school gang—who thrived and who faltered—and we encounter Lou Kline, Bennie’s catastrophically careless mentor, along with the lovers and children left behind in the wake of Lou’s far-flung sexual conquests and meteoric rise and fall. 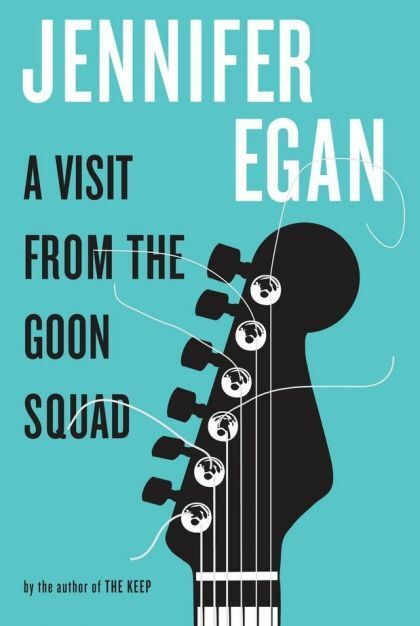 A Visit from the Goon Squad is a book about the interplay of time and music, about survival, about the stirrings and transformations, set inexorably in motion by even the most passing conjunction of our fates. In a breathtaking array of styles and tones ranging from tragedy to satire to PowerPoint, Egan captures the undertow of self-destruction that we all must either master or succumb to; the basic human hunger for redemption; and the universal tendency to reach for both—and escape the merciless progress of time—in the transporting realms of art and music. Sly, startling, exhilarating work from one of our boldest writers. I still haven't read any reviews of A Visit from the Goon Squad. The decision to order it through Interlibrary Loan came after its being chosen for the first Goodreads Book Club Selection. Winning the Pulitzer for Fiction offered me further incentive to give it a try. It's usually after reading the synopsis that I research a previously unread author further. I had to push myself to finish this book. The things that were probably considered inventive and unique by the critics and Pulitzer Jury (shifting time periods and characters in each chapter) left me looking for depth and explanations. The entire book felt disjointed. I wanted, after reading each chapter, to have the puzzle pieces fit together cleanly. I wanted to feel something for the characters. When done I wanted to feel relieved that I finished the book. I'm not relieved but in some small way, I'm glad it didn't end up on my "did-not-finish" shelf. I don't know about anyone else, but I really could have used introductions (mini-biographies) to the characters. Something that would have helped me identify with them enough to know whose chapter I was reading. I had to start chapters over several times to get into the right frame of mind and to understand what decade I was in. I found little joy or promise. The glimpse into the future was disturbing. I'd hoped that I would be intrigued by the musical inspirations, but I can't say that's the case...until the end that is. Bennie came through for Scotty. Scotty wowed the crowd. Bennie and Alex remembered Sasha fondly in spite of her "sticky fingers". These things prevented the book from ending on a sour note. Thank goodness.